Boasting 1.6 million square feet of exhibit space, the Anaheim Convention Center hosts hundreds of events each year. Whether you are in town for a trade show, industry conference, or sports tournament, Anaheim Desert Inn & Suites provides convenient access to the convention center, modern amenities, and affordable rates. 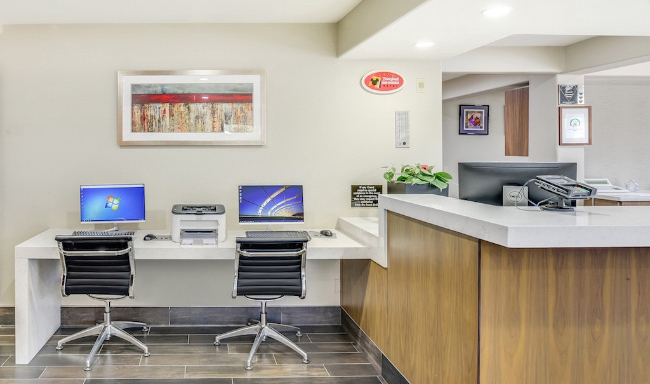 Enjoy the convenience of modern amenities such as: Lobby Business Center, Free Wi-Fi/Hardwire internet, 24-Hour Restaurant Adjacent, Voicemail, Iron & Ironing Board, Coffee-maker, In-room safe, Dry Cleaning Service and Wake-up Call Service.